Industrial production of the Basque Country in September 2015 was up by 2.9% compared to the same month of 2014, in homogeneous terms of the working calendar, according to Eustat data. The balance of the first three quarters of 2015 closed with 3.3% accumulative growth. 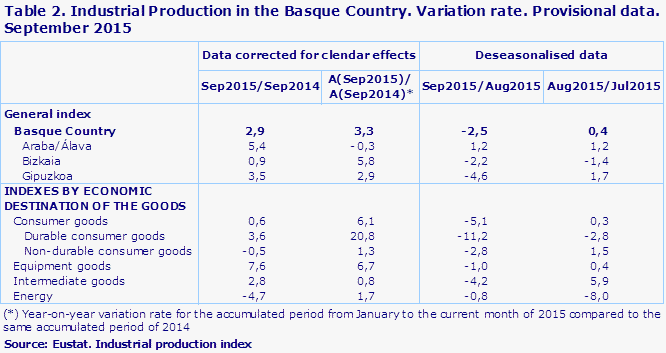 Compared to the previous month, August 2015, the industrial production of the Basque Country fell by 2.5%, once seasonal effects had been corrected. The evolution of the index in September 2015 compared to September 2014 was different for the main industrial groups. Equipment Goods rose by 7.6%, Intermediate Goods increased by 2.8% and Consumer Goods as a whole were up 0.6%, due to the 3.6% upturn seen in Consumer Durables, as Consumer Non-Durables were down 0.5%. Energy fell by 4.7%. The month-on-month variation for September 2015 on August 2015 was negative for the main industrial groups. Consumer Goods as a whole fell by 5.1%, due to a 11.2% decline in Consumer Durables, whilst Consumer Non-Durables fell by 2.8%. Intermediate Goods saw a drop of 4.2% and Equipment Goods of 1.0%. For its part, Energy posted a negative variation of 0.8%. 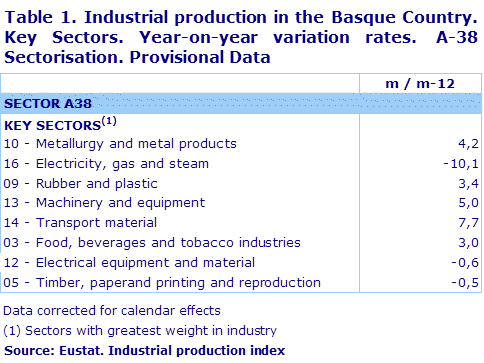 Among the largest sectors in Basque industry, those that saw the most significant growth in the month of September 2015 with regards to year-on-year variations were: Transport Material, which grew by 7.7%; Machinery & Equipment, up 5.0%; and Metallurgy & Metal Products, with an increase of 4.2%. On the other hand, there were more significant decreases in the sectors of Electricity, Gas & Steam, which posted a 10.1% year-on-year downturn, and Electrical Material & Equipment, with a decrease of 0.6%, among others. By province, the year-on-year performance of the Industrial Production Index for the month of September was positive in the three Provinces, rising by 5.4% in Álava, 3.5% in Gipuzkoa and 0.9% in Bizkaia. The month-on-month variation rate was positive in Álava, where it increased by 1.2%, whereas in Gipuzkoa it fell by 4.6% and in Bizkaia it was down by 2.2%, compared with August 2015.